The range of a price bar (or candlestick) is useful but often overlooked. It shows the price range (high-low) within a specified period. Volatility bar patterns fill this area of neglect. Examples include NR7, NR4, Inside Bar, and WR7. A WR7 bar has the widest range among the last 7 bars. (It is the direct opposite of a NR7 pattern.) The WR7 pattern is unique as it focuses on expanding bar range. The bottom panel of the chart below shows the bar range. In isolation, a narrow range bar signals uncertainty while a wide range bar shows wild trading. But to interpret a pattern, you need to pay attention to its price action context. For this, the outlook of the preceding bar is critical. This is why we are focusing on a special occurrence – consecutive WR7 patterns. In consecutive WR7 patterns, the first WR7 provides a context for the second WR7. When the consecutive WR7 bars oppose each other, the market is swinging wild. It is often hard to find an edge under such conditions. Hence, look for consecutive WR7 that clearly pushes the market in one direction. Expanding bar range requires an increasing level of market commitment and energy. WR7 is in itself a sign of uncommon bar range expansion. At that level, expanding bar range is not sustainable. That is when a price reversal is likely. 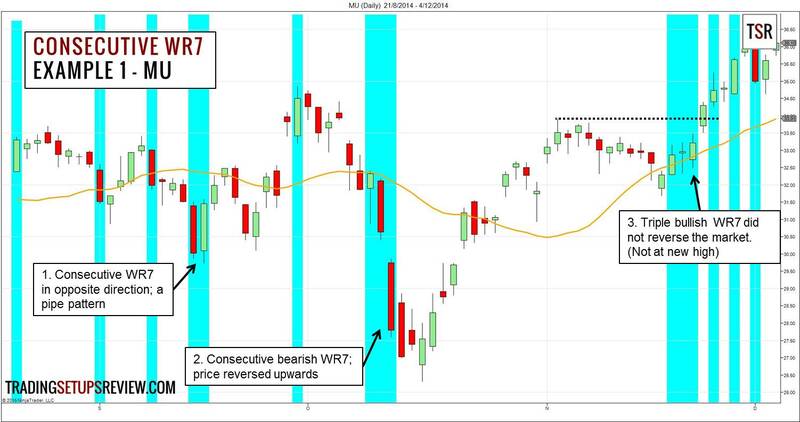 The consecutive WR7 pattern is essentially a climatic pattern. 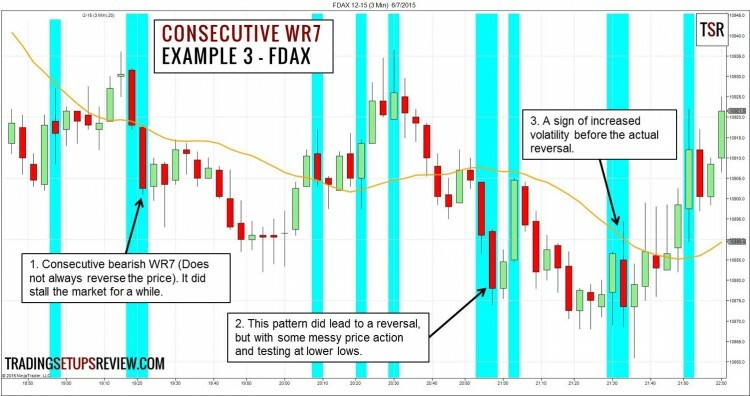 The examples below highlight the price behavior of consecutive WR7 patterns. The WR7 bars are highlighted in cyan. This daily chart of Micron Technology (MU) shows three instances of consecutive WR7 patterns. This pattern type is not the kind we are looking for here. The two price bars were in opposite direction. Nonetheless, it formed a pipe pattern, which was also useful for spotting reversals. This instance has a gap between the two wide bearish bars, pushing to new lows. Prices reversed upwards shortly after. This triple WR7 pattern has too much overlap to form a credible climax. Moreover, it was not at a new market high. This is a daily chart of Microsoft Corporation (MSFT). This is a great climatic pattern leading to a sharp reversal. Although it did not lead to a full bullish reversal of MSFT, it was at least good for taking some profits. Not all consecutive WR7 is of value. This pattern is neither a climax nor a pipe pattern. At most, it hinted at increasing price activity. Now, let’s take a look at an intraday trading example – FDAX 3-minute. This instance looked great. Yet, while it stalled the market, it did not lead to a price reversal. Not all patterns work perfectly all the time. These two WR7 bars did better. After an initial bullish thrust, the market tried to push lower but failed. A sign of wild trading as the market struggled with the decision to reverse. Eventually, the market came to a bullish resolution. 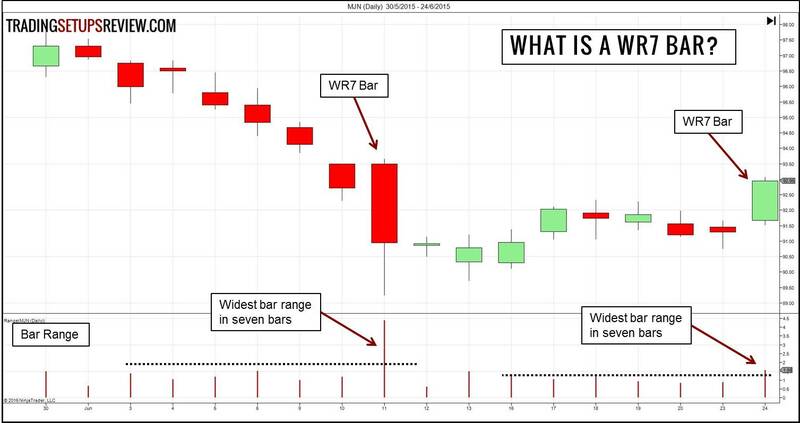 Note that in day trading, it is better to look out for WR7 patterns only after the first seven bars. (Unless you trade 24-hour charts.) It does not make sense to compare the bars of this session to the last few bars of the previous one. To do so is to ignore the disjuncture between the two sessions. Observing volume together with WR7 is the natural next step. That is what Volume Spread Analysis (VSA) is about. Understanding bar range (spread) gives you a good foundation for learning VSA. Studying bar range can yield valuable insights. To do so without distraction, consider using HiLo charts. This chart type plots only the high and low of each price bar. But for actual trading, use bar or candlestick charts. 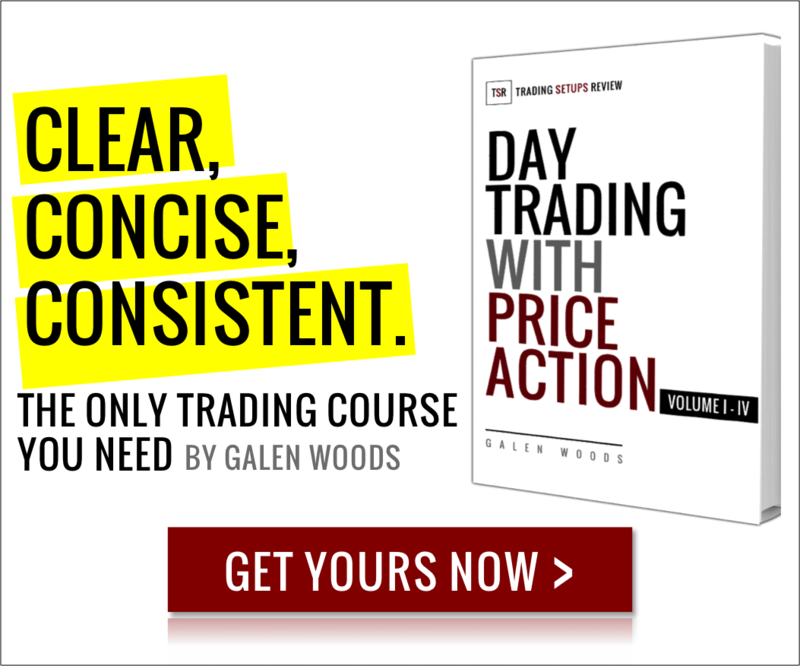 If not, you will lose too much detail (OHLC) for effective trade entries. 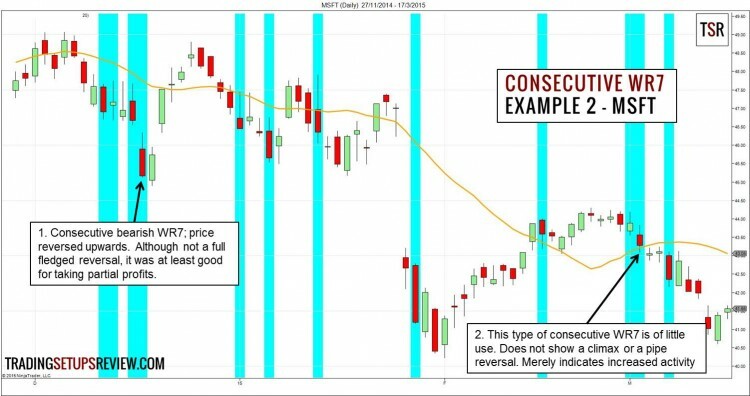 Consecutive WR7 patterns do not pinpoint reversals. Most reversal patterns don’t. When they work, they only point out the approximate price zone of the market bottom or top. The exact price and time of reversal is missing. This poses a problem to placing both price stops and time stops. Hence, think through your exit strategy before jumping into a WR7 trade. Note that what I have covered in this article is not a trading strategy per se. It simply shows that consecutive WR7 are useful patterns that are simple to interpret. Consider them in your own reversal trading methods.